Tonight I had our usual weekly Family Night. At tonight's dinner there was something extra for Sarah, Mom, Derek, Crissy and Jake. I unveiled my latest artwork to my family. I made this painting for myself to hang in my living room. I needed it to fill the recently painted wall behind my new TV and after I removed the previous artwork that had been there. There are six main elements that make up the piece. 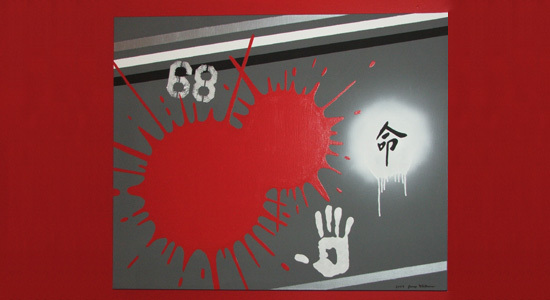 The stenciled 68 is the year that I was born. The stripes echo the angle of the ceiling in the room. The Chinese character for destiny is my tattoo. The handprint was made directing from my right hand and is the hand I use for writing. The red paintball burst represents energy and is made of my favorite color. And finally, the dark gray background is the darkness that often goes unnoticed yet is clearly visable and is always present.